It's surprising how much stuff can accumulate in the fridge in just a couple of days. You would never believe that most of these leftovers "happened" this week. Throughout the weekend, I was amazed that I could still find things that needed eating up. Here's the continuation of my weekend leftover challenge. Lunch looked like it would be interesting on Saturday. Leftover turkey and dumplings, 4 lonely-looking oven roasted potato wedges, about a cup and a half of cooked pinto beans, corn tortillas, an almost empty ketchup jar, and some pumpkin pie. How do you divide this between 5 people? 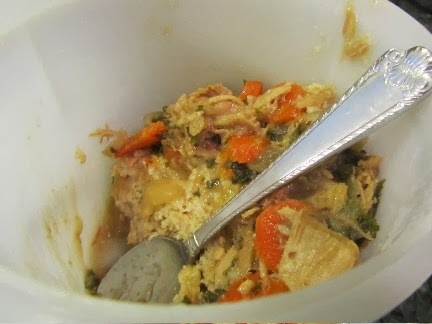 I considered making a master casserole, combining the majority of the leftovers, or maybe some soup, blended with the leftover turkey stock sitting on the fridge's top shelf. Hmm. It could work, or. . . I could have a mutiny on my hands. And so I thought, "perhaps today would be a good day to have a this-and-that lunch". We divvied up the turkey and dumplings. Anyone who wanted any could have some. Easy peasy there. Needing to find more for our lunch, I grabbed a few more containers. 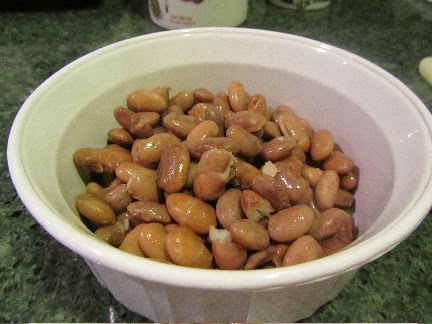 So I took the cooked pinto beans, almost-empty ketchup jar, along with some onion, oil, chili powder, cumin and salsa, and I made a small batch of bean dip. I know what you're thinking, "Ketchup? 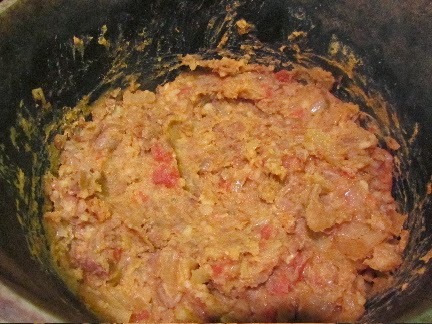 In bean dip?" It's tomatoes, onion, vinegar, salt, right? All good. Turns out ketchup works well enough in a bean dip. 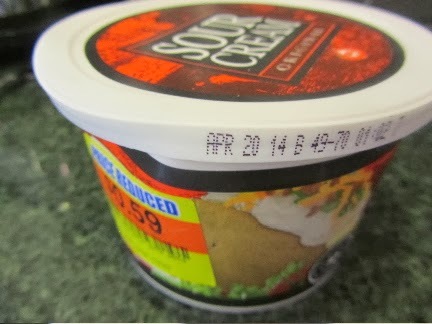 Topping the bean dip was sour cream (and yes, that price tag does say 59 cents! 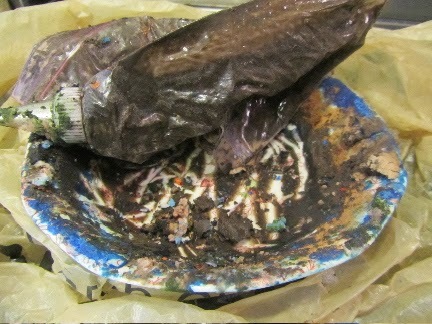 The container was squashed, but seal still good -- yippee! 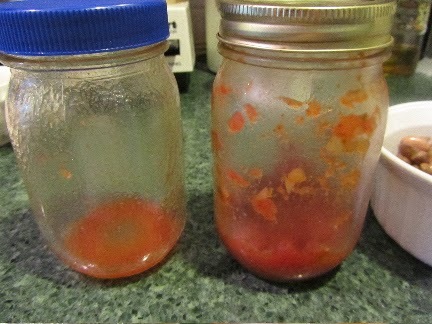 ), and more salsa. To go with the bean dip, I made chips with most of the remaining corn tortillas. 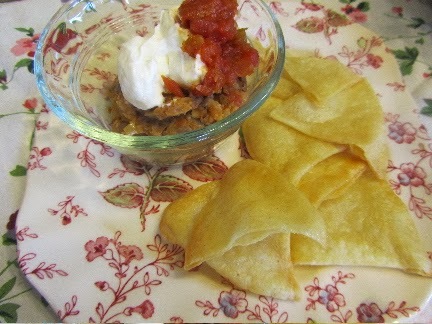 Most of us had chips and bean dip, topped with sour cream and salsa. Kind of a snacky part of lunch. 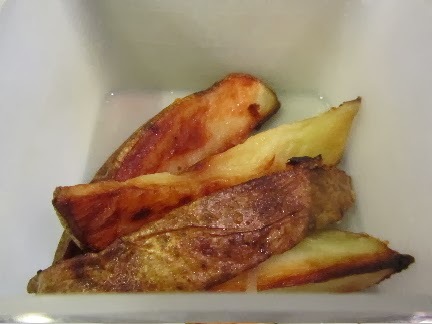 I think I'd been snacking, as I was frying with this plate of chips! I have to tell you, when I make homemade tortilla chips, I have no self-control. I kept frying and frying, yet the plate of chips didn't seem to grow. I was eating all of the chips, as I fried them. 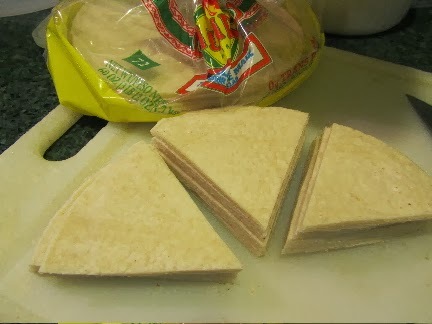 But usually, I allow 2-3 corn tortillas (cut into 6 wedges each), as a serving. Before I move on to the culinary delights of dinner, I spent some time in the afternoon cleaning out more containers for meals later on. Not very appetizing, are they? 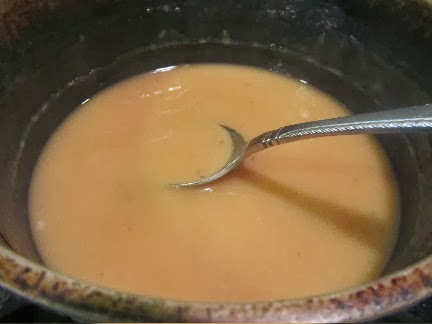 I had some turkey stock, turkey gravy and drippings from my most recent roast turkey (earlier in the week, not last Thanksgiving, I promise!). 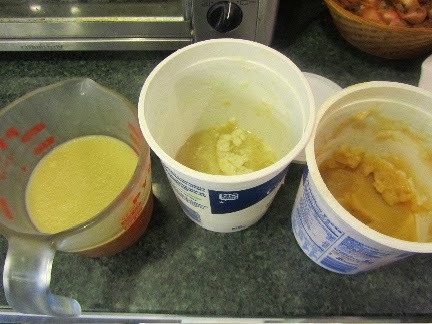 But those 3 containers turned into some delicious gravy! 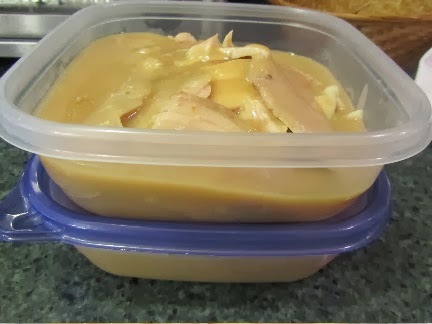 Putting those 3 together, I made a batch of gravy to go over turkey slices for the freezer. I had enough gravy to top 2 meal's worth of turkey. Any guesses what this could be? It turned into a rather tasty ingredient in Sunday's lunch! Last summer, I was reading online about making my own mint oil, using mint leaves from my garden and vegetable oil. The directions said to leave the mint leaves steeping in the oil for a couple of weeks. My leaves became very moldy. It was truly disgusting. You can't believe everything you read online. 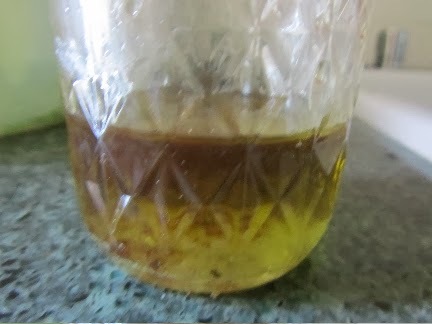 So, this is the oil after removing the mint leaves. 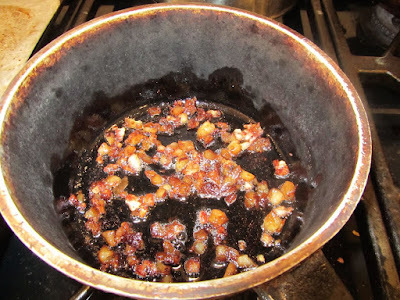 I composted the leaves, and now need to dispose of the oil. This is one of those, "it's just too disgusting to deal with" things. And that's my excuse for why it has resided at the back of the fridge since July. A leftover smorgasbord is generally considered a fun thing in our family. The kids get to choose first and my hubby and I pick the leftovers (or would that be the leftover-leftovers??). I think when the foods don't necessarily "go together", it makes it more of an adventure. You hit on the key to make it work--if some of the foods are snacky or downright dessert-y, everyone is happier. I always loved smorgasbord night at our house, growing up. My mom would add a couple of "special" things to the mix, like olives or potato chips. You're right, that does make dinner of leftovers seem fun. 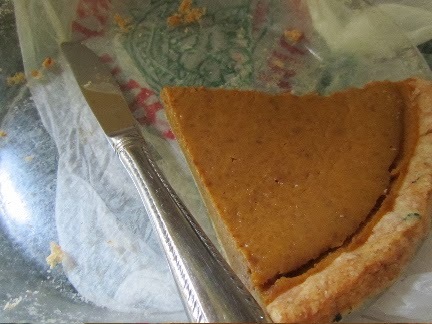 Now, downright dessert-y -- that was Sunday's lunch! 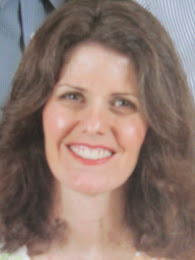 You were truly in your element combining and creating with the leftovers in the fridge. Looks like you did a very good job.